The glass jugs bobbed gently in the waters of the Mississippi as Billy threw another one out and tethered it to the shore. 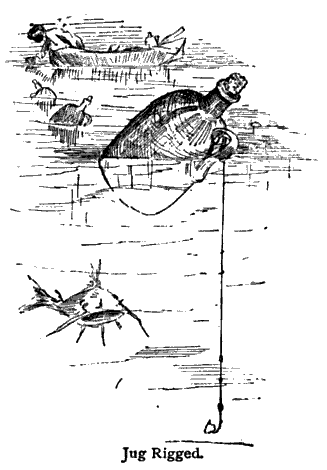 Beneath each jug dangled a line in the murky waters with a bit of dry, salted pork wrapped around a large hook. Billy called it “jugging” and told Robert that it was an old tradition on the Mississippi for catching catfish. Although that was true and he had been doing it for years, it was his attempt to hook Robert with more river Americana, actually. After all, Huck Finn and Jim caught a catfish in the Mississippi that was the size of a man---six feet two inches long, complete with a brass button in its stomach. Jugging for catfish is a time-honored tradition on the Mississippi River and its tributaries. Easy to do, jugging just involves an airtight container, line, hook and bait. Plus, a lot of patience I imagine. I have never been jugging before, but a quick search of YouTube reveals that jugging is still a popular pastime on the Mississippi. However, instead of jugs many people today use foam noodles. Jugging is a technique that dates back hundreds of years and descriptions of the process can be found dating to the early 19th century. Some very large catfish have been landed with this method of fishing. According to an article in American Angler from 1885, a 13 foot catfish was caught on the Ohio river using the jugging method. Writing a novel that takes place in 1917 involves a great deal of research. Whether its finding information about the War, jugging or funeral customs, I often have to stop writing and conduct research in order to get the facts straight and use the correct historical nomenclature. Google Books Archive has been invaluable in my research for Lilac Wine. Google has thousands of digitized books and newspapers. A couple of years ago, I took a trip to Dubuque to examine the microfilm for the DubuqueTelegraph-Herald for 1917. Now, I can view the needed issues online and never leave the house. It is in the vaults of Google where I discovered the joy of jugging. Writing is an interesting process. When I outlined Lilac Wine many years ago, I never imagined including a chapter on jugging. Recently, however, my two boys have become interested in fishing, which reignited my own joy of the sport. In grad school, I went fishing with a buddy nearly everyday. Now, I am able to do it once again with my two sons. This is what probably drew me to this chapter. I needed a vehicle for getting the characters from point A to Point B. Fishing provided the means to move the story along. And honoring the time-tested Mississippi tradition of jugging proved to be the best way to do this. Billy .... didn’t realize that the jug nearest the fallen tree had disappeared under the water. It popped up again with a splash and began moving toward the rotten trunk. Billy leapt to his feet and grabbed the appropriate line. “I knew it,” he exclaimed, excited not just for the potential catch, but for the distraction from the conversation. He was beginning to think his life was not too unlike those jugs sitting in the water waiting for a fish. Robert reached down and helped pull. Bubbles broke the surface. A forked tailfin slammed into the jug. “I told you we’d get one there. It’s a big one, too.” The fish struggled against the line, but Billy and Robert gave some slack and then pulled it again. They repeated this several times, tiring the fish out. Robert was amazed at just how strong it was. A slick body twisted at the surface near the shore, swirls of mud bubbled in the water as the catfish’s head broke the water, it’s metallic skin shimmering in the afternoon sun. After a few more pulls, they got the fish up on the grass. The fish was a good two feet long. “Probably about 20 or 25 pounds,” said Billy. “You’ll be eatin’ good tonight, my friend." I now have the “jugging” bug. I discussed this fishing technique with my boys and they were enthusiastic. Perhaps we’ll take a trip over the to Fox River and give it a try.